This recipe is 2 SmartPoints (because of the Parmesan cheese) per serving. Otherwise, it would be 0 SmartPoints. In a medium bowl, mix the kale, olive oil and garlic together until fully combined. Place on a small baking sheet and bake in the oven about 5-7 minutes, or until the kale starts to look bright green and roasted. 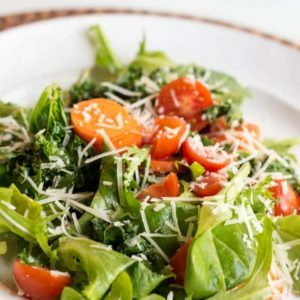 In a medium bowl (you can use the same one you used for the kale mixture), mix together the mixed greens, cherry tomatoes and carrots. Add salt and pepper if needed. Take a little bit of olive oil and use to mix with the salad. Take a little bit of olive oil and use to mix with the salad. Add in your lemon juice and stir to combine. Finally, sprinkle the Parmesan cheese to each plate and serve immediately.